This article is for those attending our Syogepi Events or those who are considering attending. Using this guide will allow us to run our event more smoothly! This article mainly deals with our Street Fighter V: Arcade Edition events, but our other events are run similarly. If you have any questions please send a Twitter DM or tweet to @Gameplay623. The DMs are open. “The concept I wanted is to make events that show people the fun of offline gaming. The games we have are mostly highly competitive type games (ie. fighting games), however rather than focus on competitiveness we would like people to just experience and get into these games and enjoy them despite the competitive element. When I started these events, I was thinking what to call it. In the end I just used my nickname Syogepi (しょげぴー) and called it Syogepi Event. The name was long so I shorted it down to “SyogeEve” (japanese: しょげイベ). What is the SFV Under Diamond Event (プラチナ帯以下対戦会 lit. Platinum and under)? Because tweets have limited characters we usually link the corresponding blog post in the tweet announcement, as well as including the main information. In the event blog posts we have links that you can follow to write up your details. The easiest way is to get off at Nakano station. You are free to leave and enter the event anytime. In the case where you’ll be going out for food we ask you to take care of your own name tag. 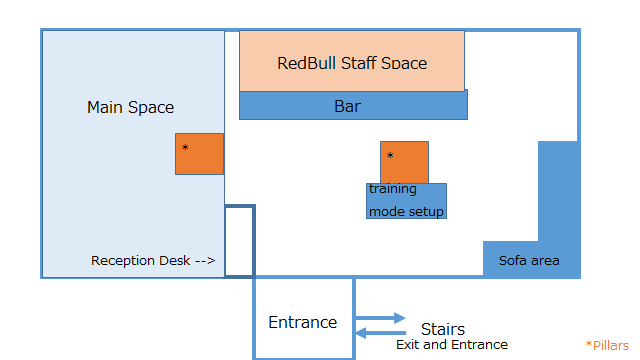 Below is the general layout of the facility and event. Of course, the layout may differ depending on the number of attendees. That being said, the reception desk, bag area will not change. As you enter the building please go straight to the desk and speak to our staff. If no staff members are present we have a bell on the desk that you can ring. Once you have been sorted out you will receive a name tag and a Red Bull drink ticket. You can use the ticket at the bar table to get one free standard Red Bull energy drink (non-sugar also available). The bag area is just the sofa area on one side of the room. Feel free to place your bags there during the event. However please bear in mind we are not responsible for your personal belongings, so please keep them with you. On the other side of the room we have the gaming space with setups which anyone can play on. At the start of the event (when there are less people) there is no limit to how long you can play. Once time has passed and people come in, we will start making announcements on the limits on how much you can play. Most commonly we use the FT2, winner stays on (First player to win two sets stays on and keep playing) (Japanese: 2先勝ち残り). We’ll also put up signs at that time so you will know. That’s it for the general rules for the event. During our SFVAE Under Diamond Event we also have a training mode setup and mini tournament (usually a random two on two single elimination). We will make announcements from reception and on our website. So please feel free to participate at our events!